Congratulations on your new Canon! Not sure where to begin No worries! Canon EOS Rebel T5/1200D For Dummies makes it easy to cut through the intimidation of working with your DSLR camera to get great shots—without breaking a sweat. With this hands-on, friendly guide, you'll discover how to get a feel for your camera, shoot in auto mode, shift to manual settings to take full control of your photos, adjust lighting, focus, and color, manage playback options, learn basic troubleshooting, and much more. Truly stunning and impressive pictures are at your fingertips! 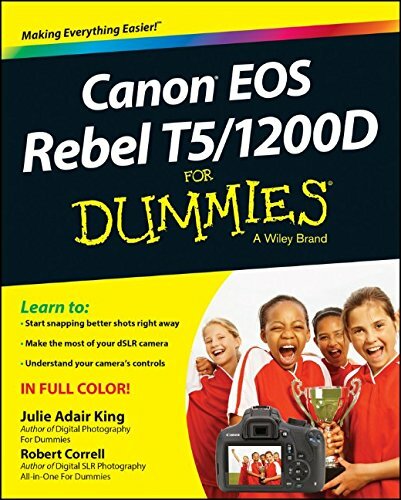 If you're a new camera owner looking to get great shots that your phone simply can't capture, Canon EOS Rebel T5/1200D For Dummies makes it easier.